With a perfect trio of freebies â?? breakfast Wi-Fi and an airport shuttle â?? the pet-friendly non-smoking La Quinta Inn & Suites Jackson Airport is one of the most popular hotels among our guests in the area. 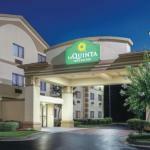 All 65 rooms on La Quinta's three floors offer cable TV with premium channels free Wi-Fi microwaves and mini-fridges. Wake up to a Bright Side Breakfast courtesy of the hotel and featuring make-your-own waffles hot and cold cereals breads muffins fresh fruit coffee and juice. Stay in shape with a few laps in the outdoor pool or get a cardio workout at the fitness center. The hotel has a convenience store and a guest-use laundry facility. Take the free shuttle to the airport. Pets are welcome for an added fee and parking is free. Located just south of I-20 off Highway 428 La Quinta Inn is seven miles from Jackson - Evers International Airport and three miles from I-55. Downtown Jackson and attractions like Mississippi Old Capitol Museum are five-and-a-half miles away. Jackson State University is a 15-minute drive from the hotel. Several restaurants can be found within a mile of the hotel. Dogs of all sizes are allowed. There are no additional pet fees. Dogs must be leashed and cleaned up after. Dogs may not be left unattended unless they will be quiet and well behaved.